After weeks of speculation about an attempt to retake the city of Mosul from the so-called Islamic State (ISIS), Iraqi Prime Minister Haider al-Abadi proclaimed the start of the offensive. “God willing, the decisive battle will be soon,” he said at a press conference. This could well be a major turning point in the battle against ISIS. Mosul, Iraq’s second-largest city, has been under ISIS control since June 2014, when it became the group’s biggest prize yet. It brought global attention that ISIS have enjoyed ever since. In the ensuing two or so years, it has ruled over the city’s hundreds of thousands of residents in accordance with a strictly enforced fundamentalist version of Sharia law. The group’s last major stronghold in Iraq, Mosul is one of the jewels in ISIS’s crown, and losing it would be a huge blow – especially after the group was routed from Dabiq, the Syrian town whose name graces the IS magazine. Fearing the worst, ISIS set oil refineries on fire to obstruct and delay the oncoming forces, while the Washington Post reports that the group has strategically decided to flee Mosul and regroup in Syria, moving from defensive to insurgency tactics. Such a move is facilitated by the strategy coming out of Baghdad, which has encircled Mosul but left a corridor to the West of the city where ISIS fighters (and supporters) can flee to Syria. This strategy seeks to move the IS problem out of Iraq and into Syria. The forces assembled to mount the offensive include somewhere in the region of 45,000 troops; they include Iraqi Shias, Sunnis, Christians and Kurds, but also Shia paramilitary groups known as the Popular Mobilisation Units. Supporting and advising this assault are British, American and Turkish special forces, while the US-led coalition has targeted ISIS mortar positions close to Mosul. 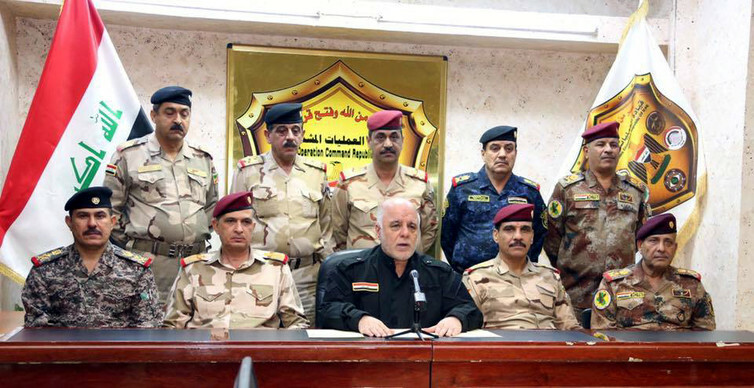 The Iraqi prime minister, Haider al-Abadi, announces the Mosul offensive has begun. For all the fanfare, the liberation of Mosul will not mean the end of ISIS. The group has never been defined by the territory it holds. As Stephen Royle and I argue in our book The origins of ISIS, ISIS is the product of deep political and sectarian disenfranchisement and of the dire socio-political conditions on the ground in Iraq. Mosul in particular is a largely Sunni city, and a number of its residents welcomed ISIS in 2014 simply because it broke the authority of the corrupt and sectarian Shia government in Baghdad. That said, opposition to ISIS’s reign has been steadily growing – documented among others by Mosul Eye, which has recorded instances of everyday resistance in the city. And while most Iraqis certainly would celebrate the defeat of ISIS, questions about what comes next – for Iraq, for Syria, and for the Middle East – simply throw up a whole other set of problems. Mosul will be far from the last battle.